We don’t usually link to any website that is not in Tropical North Queensland and/or in English, but this case is completely different. 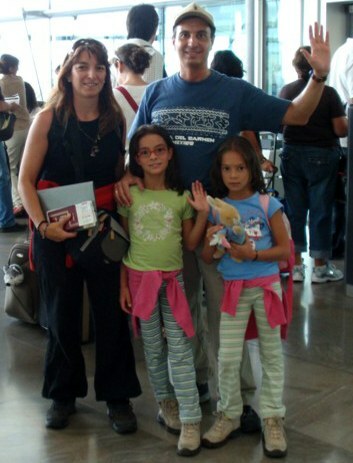 The family in the photo are our very good friends Luis and Amaya with their lovely girls, Sara and Ainhoa. Last August they started their round the world trip. Yes, it’s possible to keep on travelling once you’ve had kids. They’re the living proof. The best news about this trip is that they will be visiting us in Cairns next March. It still seems like a very long time away, but I’m sure before we even realise, Christmas will be over, we’ll be back from spending a few weeks in Spain and our friends will be knocking on our door. And to Luis, Amaya, Sara and Anihoa: congratulations for chasing your dreams and for showing us all that kids are not a burden to keep on travelling. Enjoy this year to the limit, we’re sure you’ll have the time of your life. This entry was posted on Thursday, September 18th, 2008 at 5:38 pm	and is filed under Road Trip. You can follow any responses to this entry through the RSS 2.0 feed. You can leave a response, or trackback from your own site.